On Friday, Loop PNG reported that Dr Albert Schram, former Vice Chancellor of PNG Unitech, had been arrested earlier in the week in Port Moresby and charged with “false pretence.” According to the newspaper, Dr Schram was “arrested over allegations he produced falsified and fraudulent documents relating to his PhD qualification, which he obtained on 24 November 1994 from the European University Institute.” He has been released from jail on bail, his passport confiscated, unable to leave the country. These developments are outrageous, damaging, and scary. There is absolutely no doubt that Schram has the PhD he says he has. The University’s own website has a detailed record of it, including the date of defence and the names of examiners. Moreover, the man has published a book from his thesis, with Cambridge University Press no less. The PNG Secretary of Higher Education has intervened and vouched publicly for the authenticity of Schram’s doctorate. In the face of all this, the claim of the police seems to be reduced to the allegation that Schram had earlier (presumably at the time of appointment, back in 2012) produced a “fraudulently manufactured PhD certificate.” But why would someone fake a certificate for a genuine PhD? It makes no sense. The entire thing is a beat up. The Unitech Council has disassociated itself from the recent police action, and stated that the police are acting on a complaint by the “former Council,” the one that preceded Schram’s appointment. Once appointed, Schram started cleaning up the corruption and mismanagement he found. Some members of that “former Council” responded by trying to dismiss him, including by making the same allegation of false pretence with which he is currently charged. In the end they got him barred from the country in March 2013. Schram was in exile for over a year, until, after an inquiry, he was re-admitted and returned in triumph to Unitech in April 2014 (see accounts here and here). Schram’s arrest, some five years later, is outrageous because it is so transparently unfounded, and against the rule of law. Given that the matter has already been investigated and dismissed, how did Schram’s enemies enlist the police, and get them to arrest him? The arrest sends a message that you had better be careful not to make powerful enemies in PNG or, even if you act entirely legally, you might be arrested on the flimsiest and most baseless of grounds. The episode is damaging not only because of the chilling effect it will have on domestic critics and reformers, but also because it will scare away academics and other foreigners who might otherwise be attracted to work in PNG, and take on positions of responsibility. It follows the ban on entering PNG imposed on prominent Australian academic and businessperson Ross Garnaut in 2013. It is especially damaging in the year of APEC, when the whole world is watching PNG. Finally the episode is scary because the operation was mounted so quickly. Clearly when Schram was Vice Chancellor of Unitech, he was afforded some protection from the groundless claims of fraud now being levelled against him. But Schram is no longer VC. He is in the country on a tourist visa after visiting Australia en route to Italy, his home country, on Unitech-paid tickets. His passport was confiscated the day he landed, and his arrest followed a few days later. I urge all who support the rule of law and good governance in PNG — including the Australian Department of Foreign Affairs and the Australian Federal Police — to speak out for Dr Albert Schram, and to urge the police to drop the scurrilous charges against him. Note: Schram’s tenure at Unitech ended earlier this year after a falling out with the current Council. One of the disputed claims was that, according to the Council, Schram failed to provide his “verified credentials” to the University. According to Schram, he did. In any case, this allegation is quite different from the current charge of “obtaining employment by false pretence.” More generally, the Council’s statement of disassociation is consistent with the broader view that Schram’s departure from Unitech in no way provides a basis for the arrest last week. Dr Albert Schram was a Visiting Fellow at the Australian National University in December 2017, and in 2016 presented a lecture here. Because of selfish minded people who think of personal gain/benefite pushing away the quality people like Schram. What a pity for PNG future elite. Thank you for all the insightful comments. Many have asked what is behind my arrest and the bullying of Prof. John Warren the Vice Chancellor of UNRE? Regrettably, some public universities in PNG operate like joint criminal enterprises, serving only the interest of Council members and selected senior staff. Foreign Vice Chancellor need to respect the law of the land and will always aim for compliance. This is what creates the push back. When the foreign Vice Chancellor tries to take corrective action, the Council reverses the decision. I dismissed somebody in the payroll section for stealing after internal investigations found evidence twice. Council put her back. The Councils are aware of the illegalities, but choose not to act so as not to upset anyone. The former Vice Chancellor for example misappropriated K575,000 of PIP infrastructure funding, as evidenced by an internal investigation shared with the Dept. of DHERST. Similarly, the Registrar had evidence from parents that large bribes were paid to a selection officer, but refused to act. Although there was enough prima facie evidence, senior staff refused to cooperate with any police investigations. The same senior staff in 2013, in my absence, monetized a travel allowance to the amount of 15% of base salary, which in their case amounts to an extra K5,000 to K10,000 per year. In June 2017 it became clear that this allowance was illegal, but the senior staff refused to cooperate in phasing it out. All staff gets practically free housing, and in November 2017 it became clear that taxes had to be paid on the imputed rent. The Councils like a weak Vice Chancellor and become rubber stamp machines for the Chancellor. These chancellors exercise authority without accountability, and like to call frequent council or council committee meetings so that they can travel and receive per diems. If there is a Chancellor who correctly understands his role, he is perceived as “weak”. It is truly not easy to fix University governance in PNG, but without a solution the learning experience for the students will remain abysmally bad. Beware PNG Police at APEC, they may even arrest Donald Trump for faking his identity if the money looks legal tender! Samuel Ray, your comments are shallow. See the publication via http://cadmus.eui.eu/handle/1814/5972. and confirm the authenticity of his PHD Paper. Indeed the law is weak in PNG. When you fight corruption by revealing the truth you will be a victim of good things you do. Very sad day for PNG. Politicians and bureaucrats win and people lose. We, all like-minded Papua New Guineans had this view that Professor Howes has now shared. Indeed a sad moment PNG! And for Albert Schram, we citizens know that the arm(s) of government have lost touch with reality! Thank you Professor Stephen Howes for providing a clear summary of the situation, including a link to Dr Albert Schram’s book. A highly respected publisher would not publish a book based on the author’s PhD thesis if it is not a real, actual thesis. 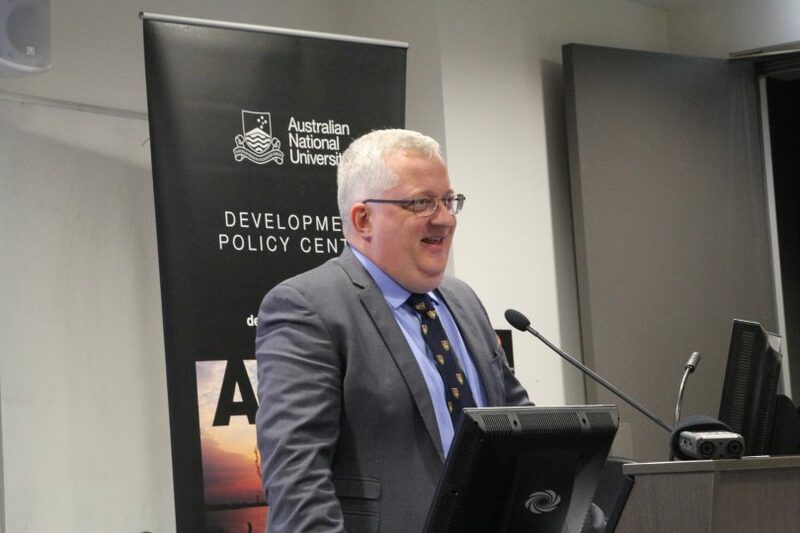 I attended Dr Albert Schram’s presentation at ANU in Canberra in 2016 and was impressed by his efforts to make a positive impact at Unitech and by his frankness about the challenges faced. The situation regarding these spurious court proceedings is indeed worrying. It might give pause to various researchers working in PNG. It certainly makes me a little nervous about what could happen if the wrong person became unhappy about something I said, wrote or did. Thanks again for the blog post, and best of luck to Dr Albert Schram in resolving this situation quickly. Thank you. I will move on, but very sad I can never come back to PNG without putting my life at risk. I feel sorry for the students who will continue to get a 3rd rate or lower education. I also feel sorry for PNG citizens having to live with such abuse of Ministerial authority, policy powers, and violence. From the outside, however, there is little we can do about all this now. Fair point, and I agree there are no winners. PNGUoT and UPNG are big ships, and they take time to turn. Trust me that I pushed hard from the management for transparency in financial administation and restructuring of personnel. For the former, I was somewhat successful, achieving an unqualified audit in 2017 for the 2015. For the latter, not so much. Each turn of the road, we found senior staff not collaborating, and since 2017 Council not supporting management. There were/ are so many issues at the University of Technology (Unitech) when Albert Schram was appointed and under his leadership, many of these have surfaced exposing top level executives,and their cronies. The fear of being exposed has triggered these accusations and believe me, as someone who has been living within the Unitech community for a long time, the student body and the community adores and applaud Schram for his contribution. His repatriation is politically motivated. Thank you, you hit the nail on the head. The PNG police force is simply a collection of guns for hire. Some say that in PNG rule of law is a joke. The Dr Albert Schram incident is to be expected given the trends of recent years. It’s no surprise really. There are claims that PNG is ruled by a Mafia and that it is even turning into a Mafia state. Dr Schram’s treatment by an apparatus of the state – the police – and the injustice meted out to him supports claims about a Mafia-like state. But this is not just about Schram. it far bigger than that. It’s a reflection of the serious situation that the country is in as the rule of law deteriorates. This is embarrassing for all stakeholders.